Conflict is a fact of life. People have different motives, methods, perspectives, and desires. Some of these are sinful some are not. In fact trying to live a godly life in a sinful world will create conflict. 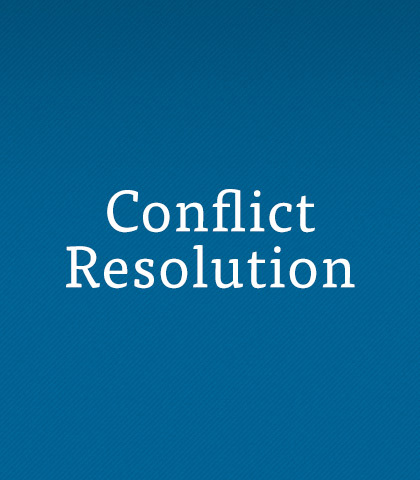 Conflict per se isn't necessarily bad. But we have a problem when conflict stems from, is expressed with, or remains unresolved, because of sinful motives, attitudes, or actions. God's Word addresses conflict with real practical direction aimed at our motives, attitudes, and actions. Type A people are the ones up front. They motivate and inspire others. Type B people work behind the scenes. They’re the thinkers, with an attention to detail. We may each be a personality type but we’re all created by God for a unique purpose. Conflict, like anger, is natural. What makes conflict sinful is wrong motives for it and negative manifestations of it. We’re all tempted to get even when we’ve been wronged; our natural reaction is to retaliate. However, a better response extends grace. It not only demonstrates self-control but it shows you don’t take your cues from how the world would respond—but rather from what God wants you to do. True wisdom originates from outside our rashly impulsive natures. Wisdom comes from God Himself—straight from His heart...through His Word...to where we live.